Torbay's lifeboat crew has rowed eight miles from Brixham in a lifeboat which dates back to 1866. The 22-strong crew took it in turns to row via Haldon Quay to Torquay to raise £10,000 for the service. 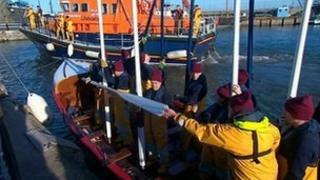 The old wooden lifeboat, which was stationed in Whitby, Yorkshire, is 38ft long and weighs more than four tonnes. The crew's wives and partners pulled an inflatable inshore lifeboat 10 miles by road from Brixham via Paignton to Torquay. Mark Criddle, RNLI Coxswain at Torbay, said: "It's just incredible to think of what the volunteers went out to in an open lifeboat with just man power to get them to the casualty. "Today, the lifeboat crew at Torbay are extremely lucky to have both an all-weather and inshore lifeboat and the most up to date equipment and training."